class Archives - GetGoing NC! The first time I went on a solo backpacking trip, I didn’t. It was back in the 1990s, I’d been backpacking with friends for about 5 years, and convinced myself I should take a solo backpack trip. 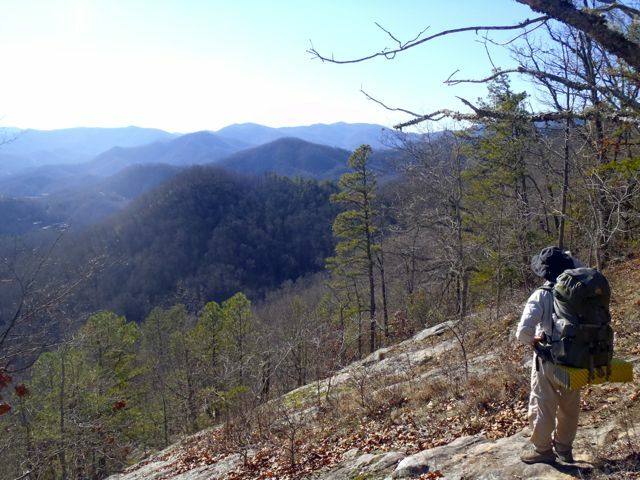 I felt good about my basic backpacking skills, I loved hiking alone … still, there was this worrisome doubt. I’d selected a spot for that first trip that I was only vaguely familiar with at the time, Panthertown Valley. I’d hiked there, but never done an overnight. It was also a long drive: even ducking out of work early around 2, I still wouldn’t arrive until 7:30, leaving precious little daylight to hike in (on a trail I didn’t know), find a spot (assuming there was one) and set up camp. It was a plan that left no room for the unexpected. Like a visit from a wayward turkey. I wound up getting to the trailhead in the dark. I could see the trailhead kiosk, and I could see a yellow sign just beyond that proclaimed, “Bear Sanctuary.” What exactly does that mean? Long story short, I checked into a motel. It would be another couple of years before I took my first solo backpack trip. Picking an area I didn’t know well for my first foray. Allowing zero cushion in my schedule to arrive at camp and set up before sunset. Not having a good map of the area (which might have shown campsites closer than the one I was contemplating two miles in). Not making a practice run setting up camp in the dark. 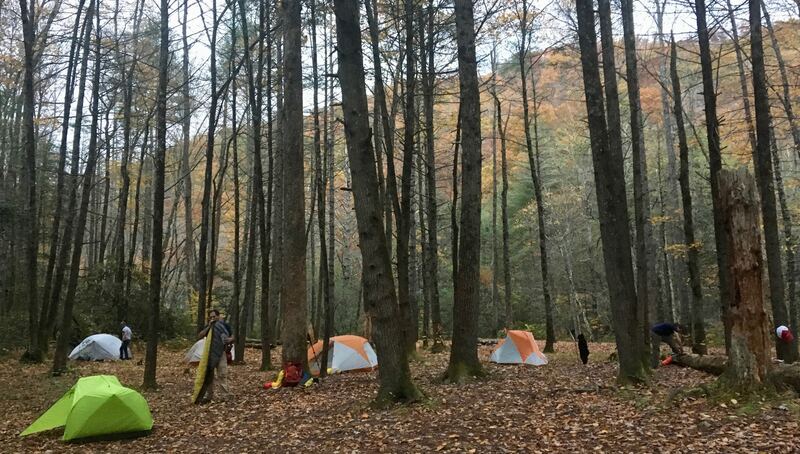 Last June, a Robbinsville grandmother and her 13-year-old granddaughter set out for a morning hike in the Snowbird Mountains of far western North Carolina. 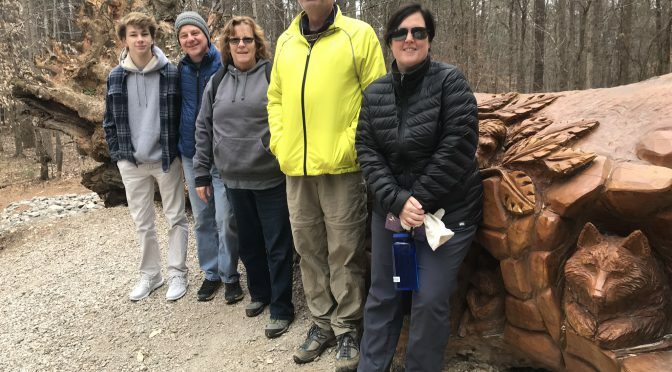 They got lost in the rugged terrain: their morning hike ended a day later when they were found by a Graham County search and rescue crew. There’s was one of the happy — if scary — endings. Too often lost hiker stories wind up like the case of the 66-year-old AT hiker who wandered off the trail to take a bathroom break and was never seen alive again. As friends and family of the hiker said later, she was an avid hiker with a poor sense of direction. Not everyone is born with a well-honed internal compass. You don’t need to be, if you follow a few simple rules. Always take a map. Even the simplest handout map at the trailhead will give you a general sense of where the trail goes. (And if there isn’t a handout map, but there is map posted, take a picture with your smart phone.) Even better is a typo map, which gives you a sense of the terrain you’ll be covering. Even on a hike you’ve done a hundred times, take a map: you never know when you may need to abandon the trail — landslide, blowdown, bear with arms akimbo who refuses to move — and you need to take an alternate course. Always take a compass. If you’re on an open peak in the West on a sunny day, you can likely figure out north, south, east and west. Not so much the case in the heavily forested Southeast. If you get lost, a map is key to helping you get righted. Know your blazes. Likely, you’ll start out on an established trail. Familiarize yourself with the blaze for your trail and for adjoining trails. If you know you take the blue-blazed trail the whole way, and the trail is well blazed, you shouldn’t get distracted. Feel the trail. You’re hiking along and suddenly realize you don’t see any blazes. One of your first clues that you’ve lost the trail should come from your feet: is the ground not as compacted as it was? Are you sinking into the leaf litter? Retrace your steps until you feel firm ground, or see leafs that appear a bit more trampled. No blazes? Blaze frequency can vary from land agency to land agency. State parks, for the most part, spare no paint. National Forests, on the other hand, aren’t as generous. If you don’t see a blaze, stop and take a close look ahead. No blazes? Turn and take a careful look back at the direction you came from. If it feels like you may be off trail, retrace your steps until you spot a blaze. Avoid wandering off trail. If you aren’t equipped with a map and compass and the knowledge of how to use them (more about that below), resist the urge to chase after shiny things in the woods. (Squirrel!) The AT hiker mentioned above may have gotten lost in the tangled Maine woods, but it is so easy to wander just a few yards off some trails and have no clue how to regain it. 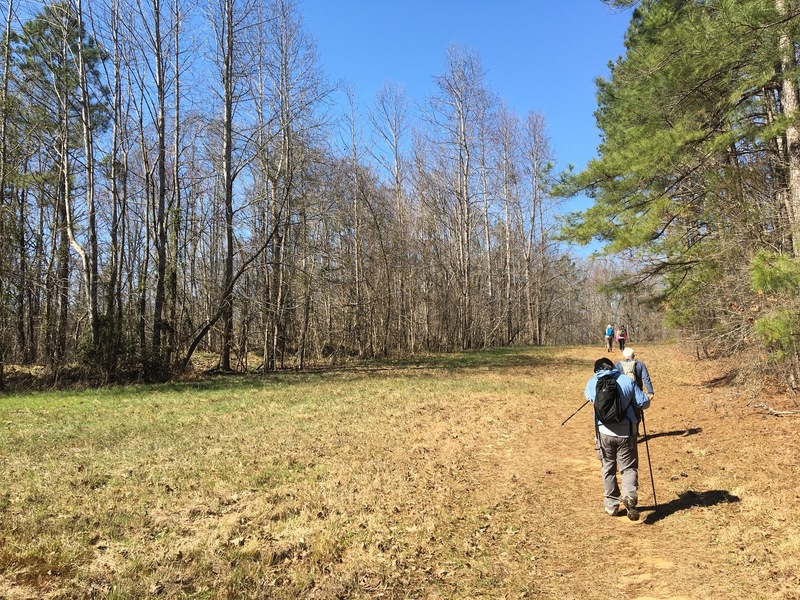 Many trails have an indistinct profile when viewed from the side, blazes aren’t always readily visible, and it’s easy to miss the two-foot-wide hardtrack of a trail while crossing it. Take note of key landmarks. Take note of key landmarks as you hike: an unusual tree, a creek, a rock outcrop, whatever. This can be especially helpful if you lose the trail and are wandering around trying to find it: you may not immediately spot the trail itself, but you might a tree straight out of Halloween central casting. Three years ago, we started our GetOriented! Finding Your Way in the Woods class. We spend about 30 minutes going over map and compass basics — nothing technical, just the essence of how a compass works, how a topographic map works, and how the two work together. 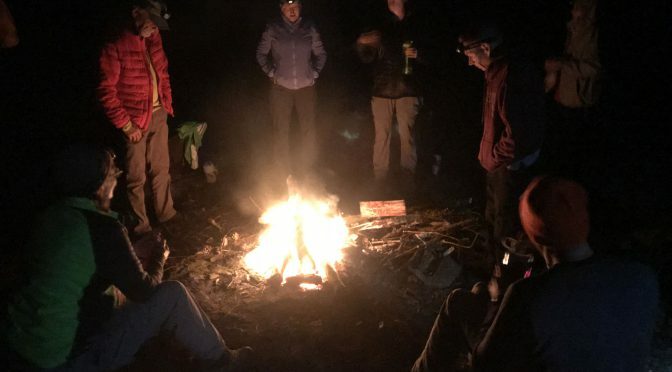 Then we venture down the trail — and off trail — to put those skills to the test and learn more about reading the terrain and finding your way in the woods. Make 2018 your year to Get Backpacking! It was cold and dark, and we were occasionally plunked with raindrops. But not a one of us moved from our spot by the fire. “What is it about a campfire?” someone asks.